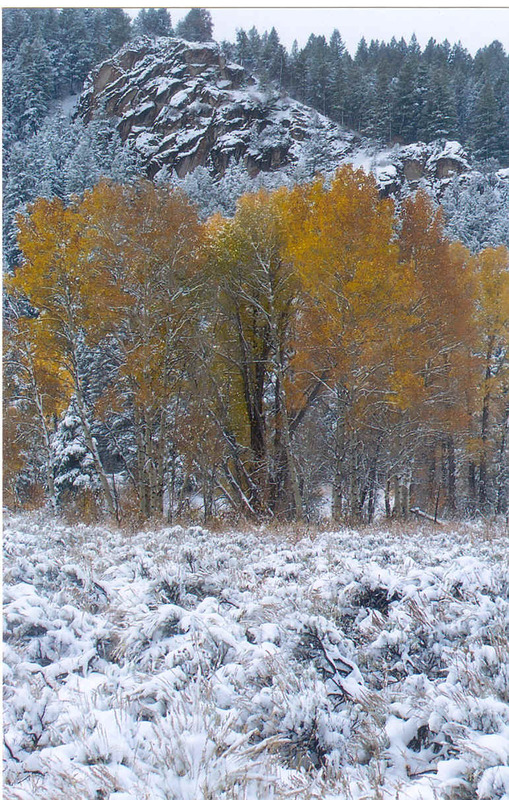 The vibrant colors of autumn leaves punctuated the freshly snow dusted pine trees as winter weather eclipsed early fall in the Tetons. A surprise snowfall which blanketed the area in early October offered vistas that I could not have imagined as I took the 45 minute drive winding through the Teton Pass from Jackson Hole, Wyoming across the state border into the tiny town of Victor, Idaho. The sun was just setting when I spotted the sign for the newly opened Teton Springs Lodge and Spa. Wending my way through the upscale residential area, the first building I spotted was, I thought, my boutique hotel. I later learned that the 8,000 square foot structure served as a second home as did many in the area. 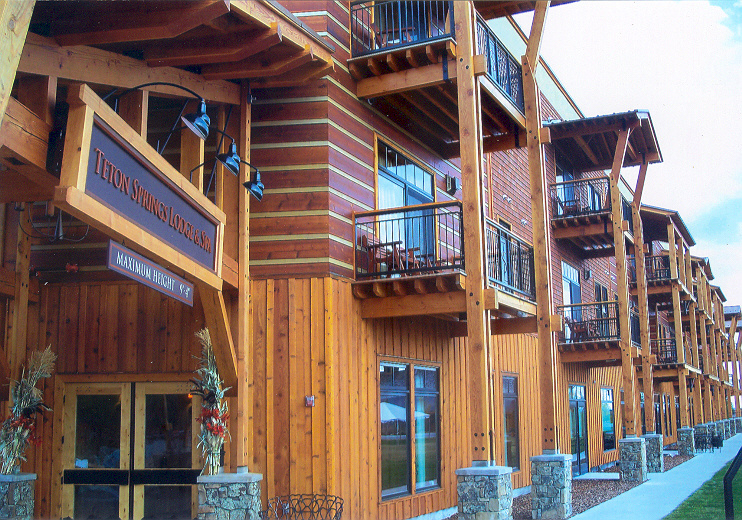 Discreetly set in this neighborhood, the Teton Springs Resort & Spa, adjacent to a championship golf course, was to serve as my base for exploring the Teton area, a gift of nature, along with some pampering at the full service spa. I eagerly anticipated my outdoor excursions which began the next morning with a fly fishing excursion on the south fork of the Snake River. My guide, Hope Strong, who regularly escorts celebrities from both the worlds of politics and entertainment on fly fishing expeditions, stopped by World Cast Anglers for fishing licenses. While there I perused the hundreds of flies displayed, fascinated by the variety of shapes and sizes and their colorful names like Prince Nymph, Brown River Legs, and Totally Stoned. This was my first experience with the sport but as we approached the river to put in I gamely pulled on my way too big waders and hopped aboard a Clackacraft with my friend Ellen at the stern, my guide in the middle rowing seat and I perched at the bow, rod in hand. My line had not dangled in the water for five minutes when I felt a tug and reeled in a small whitefish. During my three hours on the river, its banks lined with gold and rust aspens and cottonwood trees, I miraculously caught nine whitefish of varying sizes. I was told that a variety of the more desirable rainbow, cutthroat and brown trout also inhabit the waters of the Snake River but I considered myself a lucky first time fly fisher. Horseback riding was included on my agenda and I had made plans to take a trail ride at Teton Saddleback Vistas equestrian facilities in Driggs, Idaho. The unseasonable snow fall might have warranted a modification of plans but Saddleback included a newly constructed 64,000 square foot indoor arena which provided an option should the snow become too heavy. Touring the facilities, I thought how fortunate the horses were who were boarded in these modern, spacious, heated stables. I was introduced to my steed named Half Pint, a versatile performance horse who I was told was gentle enough for children but had also won a lot of money for his owners in roping competitions. 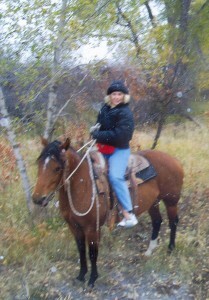 Again, I lucked out as we were okayed for a trail ride. Guided by Willum Malernee, Ellen and I were entertained with cowboy stories as he led us along the trails through the soaring pines and colorful Aspens with their white trunks and golden leaves. Snow flakes gently fell re-dusting the foliage and creating a magical winter scene as we trotted along the paths through 160 acres of wide open spaces. In my book, combining outdoor activities in spectacular surroundings with pampering makes for an ideal holiday. teton5.jpg (255675 bytes) Following my horseback ride I headed over to the Stillwaters Spa in the Teton Springs Resort where I had booked a massage. After a eucalyptus steam, I relaxed in the resting room in front of the glowing fireplace awaiting my massage therapist. The room, attractively decorated in pumpkin, chocolate and sage, offered thoughtful amenities. Again and again I was pleasantly surprised by the attention to details at both the hotel and spa. A small wooden container filled with magnifying glasses came in handy for filling out my health questionnaire. Jennifer, my wiry massage therapist escorted me to one of the therapy rooms for my 90-minute Sports Fitness massage from which I emerged feeling relaxed and pampered. I had just enough time to chill out in my beautifully appointed condominium-style suite before dressing for dinner. The chic custom western décor featured earth tones with splashes of bright colors. Following a soak in the over-sized whirlpool bath, I snuggled up in the leather lounge chair in front of the fireplace with a cup of hot coffee I had just brewed in the full kitchen. The bed, I would return to later, with its fine Italian linen, provided ultimate luxury for a sound sleep after a full day of activity. This year ‘round resort also features a fitness center, an inviting 25 meter swimming pool with outdoor lounge area and tennis courts, perfect for warmer weather. I was delighted to have discovered this piece of paradise, slower paced and more affordable than over the state line at one of the newest members of the prestigious Small Luxury Hotel’s of the World. In the nearby town of Driggs I enjoyed my meals at a variety of restaurants sporting most unusual names, but with attractive ambiences and offering a selection of mighty fine fare. The SunDog Deli and Café proudly offered a unique dish of brandy creamed locally grown organic mushrooms with crispy polenta and goat cheese encrusted lamb which would suit anyone with gourmet tastes. I enjoyed a jumbo crab cake and a very healthy and tasty quinoa salad with grilled tofu…very California, at the Miso Hungry Restaurant’s creative global foods. One evening I hung out with the locals at the Knotty Pine where I indulged in a tasty elk burger washed down with a local beer. My final day in the Teton area took me back across the state line into Jackson Hole, Wyoming to the Spring Creek Ranch set atop East Gros Ventre Butte, more than 700 feet above the valley floor. My only disappointment up to that time was not seeing the spectacular 13,770 foot Grand Teton because of the cloud cover but if I was going to see it, this would be the place. The hotel, situated on a 1,000 acre wildlife reserve provides a safe habitat for 100 species and offered unmatched views. 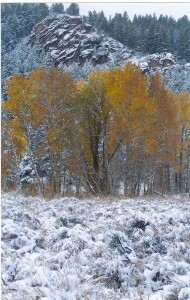 The majority of Spring Creek property is part of the Jackson Hole Land Trust and will remain open space. My plan for the day was touring some of the 350,000 acre Teton National Park with the hotel’s resident naturalist extraordinaire Kurt Johnson. He came equipped with high power binoculars and a spotting scope which provided up to 60 times magnification of our viewing subjects. This park often enables more wildlife sightings than any other US park because so much of it is comprised of open fields rather than densely forested areas. Our first stop was at the edge of the elk refuge where, with the use of our binoculars, we spotted a group of eight elk, the first of the year, slowly making their way through the mist. Throughout our wildlife adventure we caught sight of a variety of birds including three bald eagles perched on bare tree branches, several ravens, a red-tailed hawk, a trumpeter swan with an eight foot wing span and a rare Cooper’s hawk. A small family of shy, beautifully marked Pronghorn bucks and does bounded into view on Antelope Flats, back after their 250-mile migration from the Pinedale area in Wyoming. 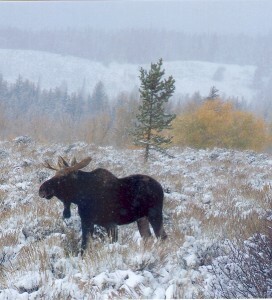 We were fortunate in coming across a bull , cow and calf moose foraging near the roadside as we departed the historic Dornan’s restaurant coincidentally situated in Moose, Wyoming, where we had stopped for lunch. This restaurant is positioned to offer a perfect view of the Tetons, but alas, the cloud cover remained. Our final wildlife sighting occurred around the early homestead area of Jackson Hole where hundreds of huge black bison grazed in the fields and sipped from Ditch Creek, ignoring us as a few slowly plodded along next to and around our vehicle. During our adventure Kurt amused and enlightened us by playing recorded animal sounds on his iPod. Our final stop, just a few yards up the road stood the oft photographed Moulton barn, most famous for the backdrop of the Teton range which continued to be invisible. 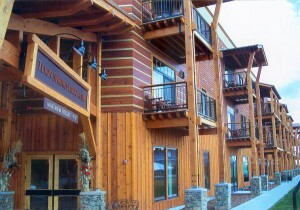 Back to Jackson Hole, we spent a couple of hours checking out the shops and galleries before heading back to our hotel. Spring Creek Ranch hotel rooms were full sized living spaces; mine, an attractively furnished two bedroom, two bath with kitchen and a view facing the Tetons. Other units fronted an attractive pond and were situated next to The Granery, where I enjoyed my last dinner in the Tetons. This gourmet restaurant presented a spectacular menu and sometimes a spectacular view. I threw dieting to the wind in exchange for a pampered pallet as I dined on Foie Gras en Brioche, Smoked Trout Dip, an incredibly tender Blackened Elk Tenderloin and an assortment of rich desserts including an oh so divine Dolce de Leche Truffle, all served with an appropriate selection of wines. 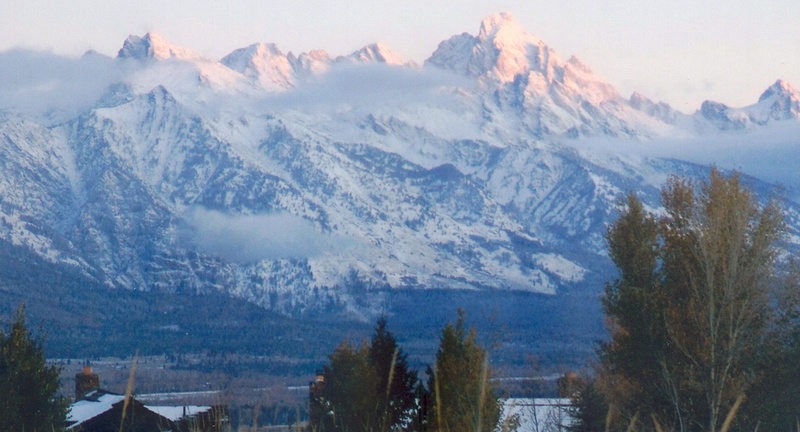 Next morning I awoke to the sun streaming in my window and turned over in my bed to see the jagged peaks of the Grand Teton soaring up through the clouds. As the morning progressed, the magnificent mountain range came into full view while I sipped my coffee appreciating my visit’s perfect conclusion to the paradise known as Teton Valley.